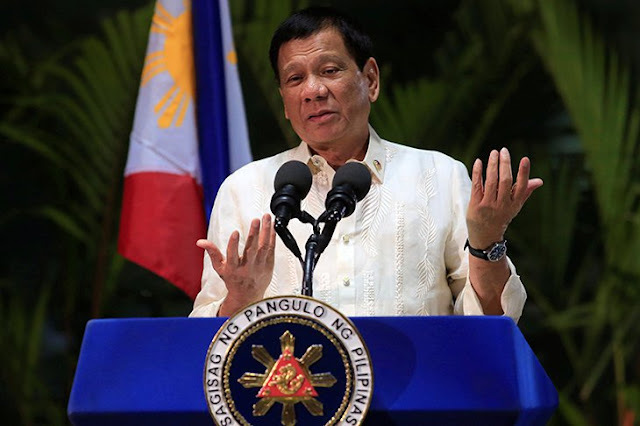 MANILA, Philippines — Groups who earned President Rodrigo Duterte's ire are not likely to get a respite from his tirades as he vowed not to allow his critics to outdo him in their word war. Duterte claimed he was "bringing the issue of freedom of expression to the edge of the universe" as a response to critics whom he accused of disrespecting him. He said among those who went too far in criticizing him were Catholic priests whom he claimed had backed calls to oust him. "If you criticize me in the church... You run the risk. Eh ako, hindi talaga ako magpalugi... Mamatay man ako kung mamatay, hindi ako magpalugi (I won't let you outdo me. I'd rather die. I won't let you outdo me)," the president said during a campaign rally of the Partido Demokratiko Pilipino-Lakas ng Bayan in Koronadal City last Tuesday. "But I really do not enjoy it. But I got angry and (that's) the only way to also put them in their appropriate place. Sumobra kasi ang Katoliko eh (The Catholics went too far)," he added. Duterte has been badmouthing the Roman Catholic Church in his speeches, saying the institution has no moral ascendancy to criticize him because of the misdeeds of members of the clergy including sexual abuses of minors and nuns. The Catholic Church in the Philippines has also been proven to have covered-up cases involving clergymen and minor children. Duterte has defended his crackdown on illegal drugs, saying it would reduce crime and make the streets safer. He has also asked law enforcers to gauge peace and order situation in their areas by allowing their wives and daughters to walk the streets at night. Duterte, who claimed to have been abused by a Jesuit priest when he was in high school also called the priests "stupid." In the same speech, Duterte accused bishops of supporting elitists and chided Catholics who kept their faith despite the scandals that hounded the clergy. "Katoliko pa rin kayo? Hindi na ako bilib sa inyo. Totoo. Mawawala ang respeto ko sa iyo (You are still Catholics? You will lose my respect)," the president said. He reiterated that priests should not use their sermons for politics. Duterte also chided the senatorial candidates of the opposition slate Otso Diretso, whom he claimed have not done anything good for the country. "I said, kindly use your common sense when it comes to Otso Diretso. I am not asking you to follow us. Basta sinabi ko sa inyo kung ano lang dapat (I told you what I think is right)," he said. "If you think I’m a lousy messenger, eh di huwag (Don't follow us)."